Heaven is a concept of the afterlife (what happens after somebody dies) in many religions. Some people who believe in heaven say that it is a place that is perfect. They believe heaven is where people will go after they die if they have been good. Some people also believe in Hell, which is a place where people will go when they die, if they have been bad. They believe hell is a punishment for being bad. Ideas of Heaven and Hell are not the same in all religions. Sky – the atmosphere that covers the Earth. The first time that it rained, it says, God opened "the windows of heaven." Outer space – the sun, moon, stars, planets, etc. The place where God lives and rules eternally. The people called prophets in the Bible, like Isaiah, often spoke of a physical Kingdom of Heaven that will occupy a new Earth, and ruled by God (Messiah) in the flesh himself, where we will have physical bodies that do not die. Heaven is where all the true believers go. Catholics believe Mary is the Queen of Heaven, officially defined by Pope Pius XII in 1954. However many Protestants see this as not in the Bible. According to the Quran and Hadith, Heaven is a place of reward for those believers who accept the true faith and practices the teaching of Prophet Muhammad. The eternal life will be perfect, with thousands of types of food and clothing more beautiful than humans could ever imagine. There will also be no sad feelings, stress or pain and related problems of life. 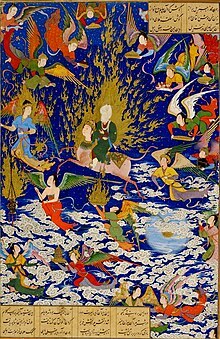 Baha'is believe that Heaven or (hell) being specific places as symbolic. 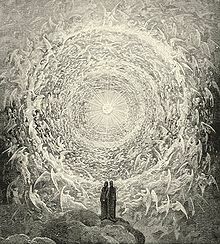 The Aqdas, the holy book of Baha'is, along with other Baha'i books, describe heaven as a "spiritual condition" where being close to God is called heaven. Hell is seen as being separated from God. Bahá'u'lláh, the founder of the Bahá'í Faith, said that the afterlife is beyond human understanding. Summerland is the name given by Wiccans and other Pagan (old European religions) to their belief of afterlife (life after death). ↑ The Amazing Bible Factbook. New York: American Bible Society. 2008. pp. 104–105. ISBN 1603207783. ↑ Masumian, Farnaz (1995). Life After Death: A study of the afterlife in world religions. Oxford: Oneworld Publications. ISBN 1-85168-074-8. This page was last changed on 11 January 2019, at 17:54.